You can use Edraw to get the initial thinking done, then just a quick export ms word and you've got a finished clean text documents. You can use Edraw to get the initial thinking done, then just make a quick export to MS word and you've got a finished clean text document. Here are some basic tutorials to demo how to export Mind Map data to MS Word step by step. When the mind map is complete, it would be highly productive if the data in this diagram could be shared with Microsoft Word applications. How do you make it look polished, professional, and ready to share? In Edraw, you can easily modify your Mind Map diagram to fit your needs. 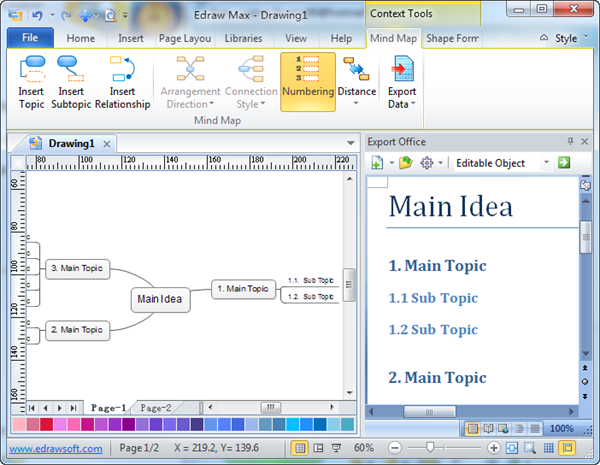 The following simple mind map was created by the Edraw mind map program. In Edraw, go to the Mind Map Tab of the Ribbon, select the Drop-down for the Export Data item and choose "Microsoft Word Format". When this action is complete, Edraw will launch Microsoft Office Word and generate the Word Document including all of the data from the Mind Map. The MS Word document window will be embedded into Edraw program and the data of the current diagram will be exported to a blank MS Word document automatically. Note that the Main Idea is formatted in Word's Title format, The Main Topic is formatted in Word's Heading 1 format, the next tier in the Visio hierarchy is formatted in Word in the Heading 2 format, etc. Tips: To export the whole diagram into the MS Word, please visit this page.